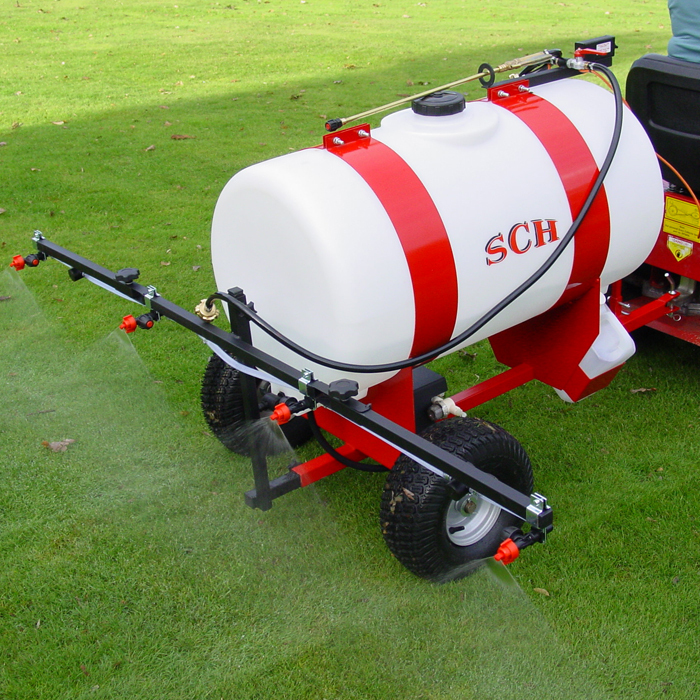 The GWCS9 sprayer is capable of applying herbicides and fertilisers to both large and small areas. The single application nozzle is height adjustable giving spray widths of 34" up to 84". The sprayer is also supplied with a single brass trigger lance for spot spraying. A dribble bar can be supplied as an optional extra for use where drift could be a problem. The sprayer has a pressure gauge for use where accurate calibration is required. In line filters prevent tiresome nozzle blockages. Wide profile penumatic wheels, running on roller bearings help to prevent wheel marks on the grass. A 5-litre water bottle is incorporated for dowsing incase of spillage. The 12-volt diaphragm by-pass pump is powered from the towing vehincle. Optional extras include; break back boom, dribble bar, verticle spray bar and a telescopic lance.